Athletes are the heart of Special Olympics. 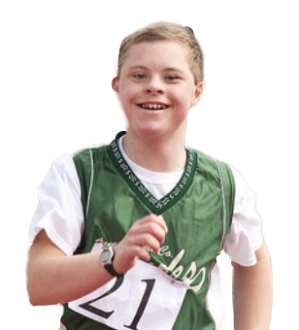 Our athletes are children and adults with intellectual disabilities from all around the world. They are finding success, joy and friendship as part of our global community. They're also having lots of fun! Everybody is different. Special Olympics is for people who are different because they learn new skills slowly. They are different in other ways as well. They have an intellectual disability, or ID. Intellectual disabilities happen in all cultures, races and countries. The goal of Special Olympics is to reach out to the nearly 200 million people in the world with ID. Our 5 million Special Olympics athletes—ages 8 years old and up—come from more than 170 countries. We also have a Young Athletes program for children ages 2 to 7. At any age and in every country, our athletes are learning new skills, making new friends and gaining in fitness and confidence. "They Make You Feel Different—It's Fantastic"
Special Olympics trainings and competitions happen 365 days a year in 172 countries. We offer 30-plus Olympic-style winter and summer sports. So whatever your age or skill level, Special Olympics has something for you. Many athletes start in one sport, then go on to try others. Through sports, our athletes are seeing themselves for their abilities, not disabilities. Their world is opened with acceptance and understanding.They become confident and empowered by their accomplishments. They are also making new friends, as part of the most inclusive community on the planet—a global community that is growing every day. Abdel-Raman Hassan is an athlete whose life changed after he joined Special Olympics. He's a swimmer with ID from Saudi Arabia. He is also partially paralyzed. Yet he doesn't let anything—or anyone—put limits on his abilities. His talent for swimming did not come naturally or easily. Abdel-Raman's father says it took him a month to hold his breath underwater for three seconds. It took him a year to swim a distance of one meter. He did not give up. Abdel-Raman went on to win gold medals in 25- and 50-meter races at World Summer Games. He is a champion. Through sports training and competitions, Special Olympics helps people with ID find joy, acceptance and success. As their lives open up, athletes gain the confidence that comes with achievement. They feel empowered. They are ready to take on new leadership challenges to make use of their new abilities. They can become mentors for other athletes. They can train to become coaches and officials. They can also move toward a more public role as a speaker or spokesperson. They can speak to audiences and journalists about the positive changes that Special Olympics helped bring about in their lives. 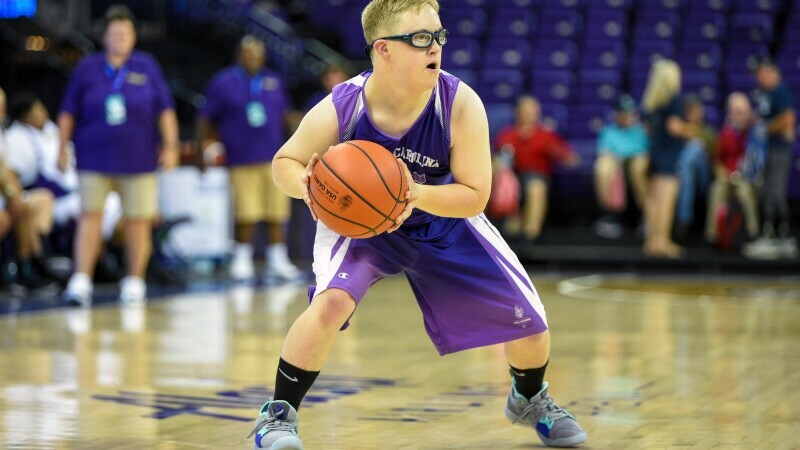 At Special Olympics, our athletes are empowered to share their many gifts and talents with society. Yet, it's more than that. Our athletes also become empowered to be leaders in society—and teach us all about acceptance and understanding. 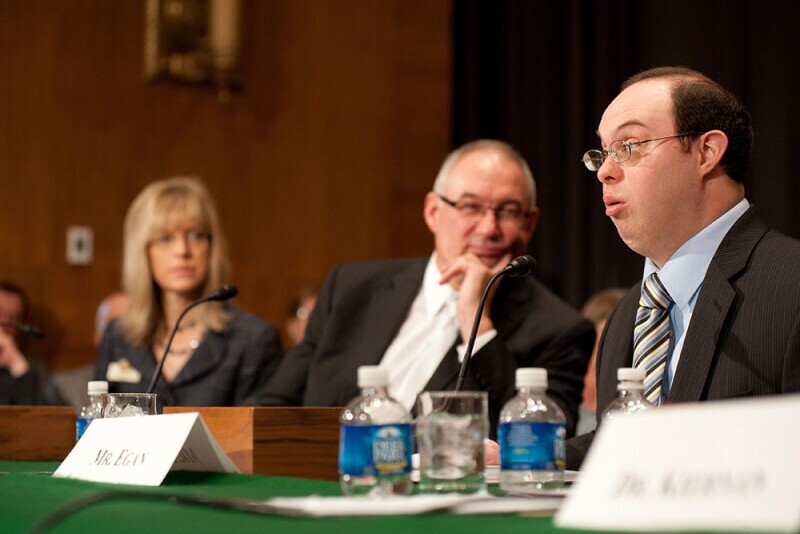 David Egan testifies about employment for people with ID at a committee hearing of the United States Senate. There are as many as 200 million people with intellectual disabilities around the world. Our goal is to reach out to every one of them—and their families as well. Special Olympics athletes are people who are 8 years old or older and who have an intellectual disability. There is no upper age limit, and in fact, nearly one-third of our athletes are age 22 or older. Our 30-plus sports are seasonal, so some are winter sports and some are summer sports. All sports are coached by certified volunteer coaches. Start the process of becoming a Special Olympics athlete by getting in touch with the Special Olympics office nearest you. Special Olympics offers many ways to take part. There are short-term and long-term volunteer opportunities, the option of playing Unified Sports and to become a Special Olympics athlete.